Now more than ever, key areas of your business need key management tools. TIMS Bulk Gas Manager not only helps you control your bulk tank assets, it enables you to view and forecast usage rates and manage pricing. In addition, with the new TIMS Delivery smartphone app, you’ll be able to accept mobile credit card payments and capture e-signatures at the point of delivery. Manage bulk tank assets, usage rates, forecasting methods, price management, and order processing and billing. In addition to traditional tank forecasting methods, TIMS Bulk Gas Manager can integrate with leading telemetry reading devices to capture actual tank levels to help schedule and forecast replenishment orders with greater accuracy. One simple, seamless way to track and manage all of your bulk gas deliveries. Manage bulk gas tank installations, forecasting, ordering, scheduling, delivery, billing, and payment processing. With TIMS Bulk Gas Manager there’s no more guesswork. Fully integrated with the core TIMS system in real-time. 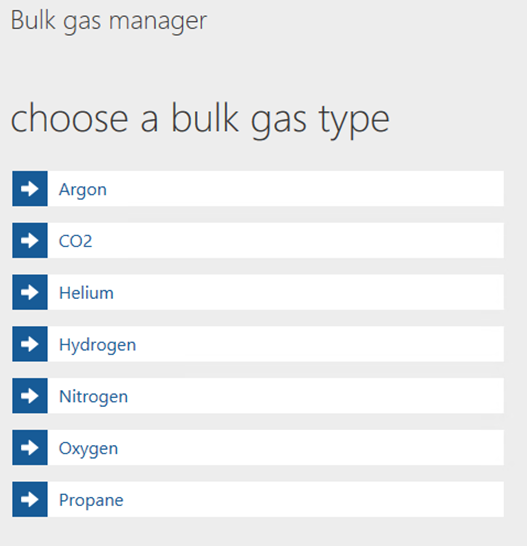 Use Bulk Gas Manager to view deliveries, tanks, usage overrides, regulators, and readings.